Our Live Catch Cat Cage Trap is for trapping wild, feral or nuisance stray cats humanely. If you have a problem with wild or feral cats fouling or digging in your garden, or if you want to catch and train a stray cat, these purpose made cat cage traps are most effective. 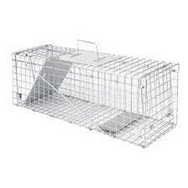 Our Live Catch Cat Cage Trap is of superior quality compared to some cat traps on the market. It is made of galvanised steel which is rust proof and gives this trap a very long life. The design of these cat traps make them the most effective at catching and trapping cats. You simply bait the trap just behind the tread plate and once a cat enters to reach the food source, a spring loaded door closes fast! This is not a folding trap but comes ready made and ready to use.